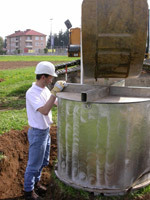 In April 2006, a weighable monolithic lysimeter for determing the grass reference evapotranspiration was installed at the Wagna research area. The following pictures show the most important steps of the construction procedure. and soil inside must not be compressed! on the site area to guarantee that soil is backfilled with the exact layers.